Sarah’s favorite gadget is an iPhone, news reading app is Feedly and time-saving trick is setting up labels, filters for emails. 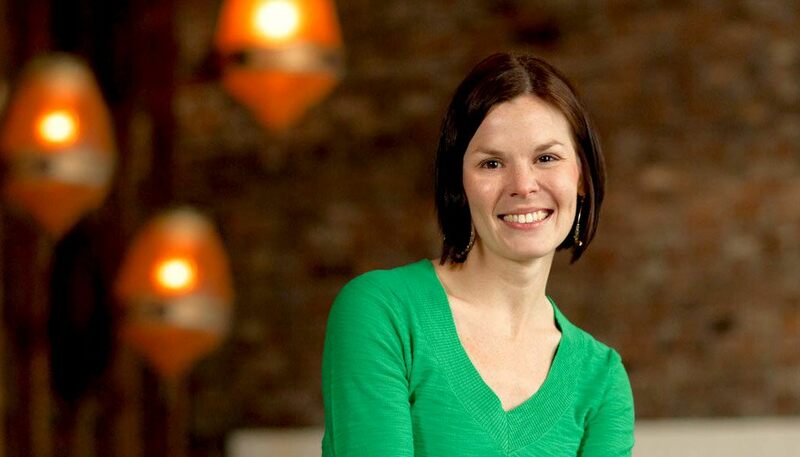 Her favorite blogs are Quick Sprout, The Everywhereist, A List Apart and Houzz Blog. Our business is 100% remote so all team members work from home or their favorite wi-fi spot for a change of scenery. I work from my home office, separated from the rest of my house. I handle all design and some minor front-end development work. My right-hand developer handles CMS integration and the majority of our front-end development. Most of my day is spent managing projects and designing as well as most client communication. I wear many hats. I generally work 7 to 4 pm depending on the day. Every day is different, but I usually start the day with emails and inquiries or spending time on social media and marketing for SLD. At about 9 or 10 I jump into client work which for me consists of sketching/brainstorming, designing and a variety of tasks such as website testing & reviewing and analyzing client web analytics. My day usually ends with any of these tasks. If you haven’t checked out Buffer App, it’s the holy grail of social media. You can schedule posts across multiple accounts based on a set schedule which is a huge time saver. If you’re like me, you find yourself spending too much time consuming content when engaging in social media on Twitter, Facebook, Pinterest and LinkedIn. Scheduling content and even replies to others using Buffer really makes a difference in my productivity on social media. Another area that may be helpful if you manage your own business is an accounting web app called Freshbooks. I use Freshbooks to handle my billing, expenses and time tracking. It's reasonably priced, super easy to use and makes tax time and monthly billing a breeze. Saves me tons of time! And last but not least…Brightpod! We haven’t been using Brightpod too long, but it has a little bit of everything we need to do project management and website testing. Our number one goal is to keep better track of tasks at hand and keep emails down to a minimum. Currently we have two projects and two team members in Brightpod as we just recently started using this to manage our web work. Our projects generally consist of digital work such as websites, email campaigns & app design. We also offer branding and graphic design work which we combine into one project on Brightpod with separate tasks. Yes we have tried a handful of other project management apps. We recently closed our accounts with Basecamp and Sifter. I’ve also tried Trello, Bugherd and Asana to name a few. We wanted to find a single service that offered a simple way to do both website testing efficiently as well as manage our design and development tasks. Brightpod has a great layout so you can see a lot of tasks at once and easily organize them into visual groups in a snap. It’s almost a cross between BugHerd and Basecamp, but done very effectively so it’s simple and focused on the most important features at first glance. I’ve also found the Brightpod team to have some of the best customer service I have experienced using a project management tool. They are quick to respond to new suggestions and questions and always friendly. I haven’t tried inviting our clients into the environment yet but will be doing so shortly. With a simple interface it should be a fairly easy system to teach a client to use. Not yet, but I’m sure the time will come! I didn’t have much trouble at all setting up our first few projects. When I did have a question the Brightpod team responded immediately with an answer or by actually scheduling an interface chance to improve the product for all users. They really do care about their customers and that is evident in their customer service. Do I have to pick just one? :) I love the drag and drop interface and the fact that you can customize what each column is named. This makes it incredibly flexible and I can see many different types of businesses being able to use BrightPod due to this. Another nice feature is the overall design. At a glance you see all of your tasks and can only do limited changes to a task without clicking the individual task on a board. They designed it this way so that it remained simple for users who didn’t need all the bells and whistles. For those who want more functionality, you can do things like comment on a task, attach files from Dropbox, Box or Google Drive and a few other features just by clicking into a task. I would have to go back to paying for two separate services that meet my needs vs. one. It would cost my business more money per month. There are certainly options out there, but Brightpod solves all my needs in one solution. I haven’t found anything out there that does that, until now. I highly recommend checking out BrightPod! Give it a try for free and see if it allows you to save some additional time and money like it did for my company. Cheers! Thank you for your time, Sarah!